The ride was great, along with the history of the railroad. Good weather so the views and scenery were quite good. Excellent trip, one of the best during our travels in Australia. Great blend of viewing the rainforest canopy, rainsforest activities and a relaxing railway return. Great for familiy's and not too intense. Very well organised. Great day out - scenic railway to Kuranda, then skyrail back down again. Didn't book any other element of the package, but the aforementioned combination only allowed us time for lunch in somewhat touristic Kuranda. Overall great value, would recommend. 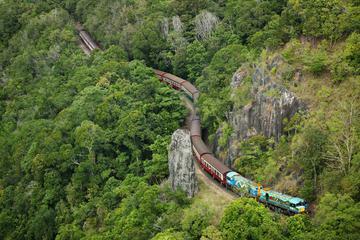 The Kuranda Scenic Railway trip is an excellent day out. We caught the train from Cairns to Kuranda and then got the Sky-rail back. A little bit rushed so don't expect to see all the attractions of Kuranda in one day. We saw the Kuranda Birdworld and Kuranda Koala attractions which were both wonderful. The train trip was interesting with many bridges and tunnels to navigate. The Sky Rail was great with the view of the rainforest and waterfalls to enjoy. Not to be missed. very enjoyable day, would recommend this to everyone. A great day out. This trip proved better than we expected. The coach driver was very well organised, as various people were doing activities in a different order. all the relevant information was made very clear. The train journey is magnificent, very scenic and a sociable ride. There are a variety of activities available in Kuranda, shopping, wildlife, butterflies and river trips and many places to eat. The cable car down provided magnificent views.. Very enjoyable excursion both the train trip and the cable car the views were spectacular however there was too much time available for the market at the top 4hours which was unnecessary especially in the extreme heat. Excellent tour. Loved seeing the rainforest. Awesome seeing the Barron Falls.Taking the skyrail up and railway down was fun. Shopping in Kuranda was great. Lots to see. Wish we had more time to shop but it we had a wonderful time.